I didn't think it would happen, but I believe I'm there. 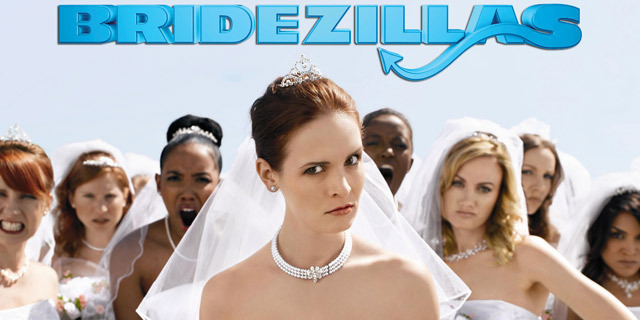 I've become a bridezilla. Ok, I may be going a little dramatic here, but as a first-time bride I am just now becoming enlightened to the scam that is 'the wedding'. I knew from friends complaining or segments on tv discussing ways to save on getting married, but I really did not realize how you can walk into a normal store and mention the word wedding and the price immediately increases four times its normal value! I pride myself on being a deal-finder and a somewhat frugal shopper. The goal is to find the best quality item for the cheapest possible price, right? I rarely pay full-price for anything - hitting up stores prepared with a coupon. I even have multiple apps on my phone that help give me good deals. But, wedding changes everything... going cheap can very easily mean going extremely tacky. My first introduction came when seeking out venues to house our reception. I actually work in a location that is notorious for putting on weddings. It was the first venue I priced out and I scoffed saying, "I'm not getting married here, that price is crazy - I can totally find a better deal than that!" A few weeks later after endless hours of searching I was extremely humbled and appalled but the reality of what we were facing. We looked at hotels, barns, resorts, bars, restaurants, and everything in between. Suffice to say, we are now booked at the place where I work after realizing what a good deal they actually are; they don't charge for the location so all your money goes into your food and set-up and at the same time they do everything so you don't have to worry. Not having a wedding planner, this proved to be more what we were looking for. Earlier that week Chad and I visited this barn about 40 min outside of Madison. It was beautiful spread out on this vast countryside on a horse-farm. There were rolling hills, luscious trees, even a gravel path and the option to add a horse drawn carriage if you so desired. Let's book it! Then we get out of the car to check it out. We are literally blown away - it's so open that there is this constant breeze that rolls over those hills. "This wind is typical" says our guide. Are you kidding? I'm not one for being prissy, but getting my hair done in these circumstances would be a waste because it would be destroyed after about 5 min. And the barn? Basically a wooden box that turns into a massive wind-tunnel once you open the doors. It's base price? $3500. Exqueeze me? That's over 25% of our budget and we haven't even fed anyone yet. Oh, and we haven't even sat everyone yet? Yep - luxuries like chairs and tables tack on even more cost because that price doesn't include anything. That's just for the use of the barn. And this place is booked for the next year and a half? Who are these people out there paying this?! And people actually spend this to get married? And there are people who get married more than once? I don't know how they do it - I guess I'm too cheap! Reality ad sunk in. This is NOT going to be easy. Here we are working to start our lives together to do crazy things like 'buy a house' and 'have a family'. I think I have a decent job. I don't spend frivolously. I don't go on crazy vacations around the world. We live within our means - so I thought. So, tacking on the price of a wedding and the reality of what people really pay was quite a shock. We still are working to have a wedding near our goal. I anticipate our final price will spike a bit more than we first had hoped. The best way to keep the wedding cheap? Cut the guest list. This really isn't an option since having our friends and family there was one thing that was important to us. Plus, the idea of a nice sit-down dinner has been something we always wanted. Feeding people (and allowing them a spot to sit) proves to be the other really expensive cost so we are keeping our guest list to 150 max. I've come to realize that the wedding isn't just the one day. It's the whole time leading up to and culminating with that one day. So, if you are going to put so much time and energy into all the details and spend so much money, you may enjoy all the time up until the wedding. If you make it a conscious choice - I think it really can be enjoyable. So long as you can let things go and just be happy with only investing a the few things that actually matter, then the wedding is do-able. Our biggest investment at this point is in our photographer. That was something we didn't want to skimp on. Other than that, I've really learned to let go and ask the question "is that something I'm really going to look back and think I could have lived without? One luxury that I've already come to let go on was a sort of 'add on'. I grew to really love the idea of having a photo booth because I loved the idea of having a guest book with lots of funny photos of our family and guests. But, at the end of the day is it worth it for the price of $750? For a book? with pictures? After we already are having a pretty great photographer? no. Jane! I hope you aren't buried somewhere under bride's maid dresses and bouquet pamphlets!! You can always do what we did...Vegas!